Here's a different trade type, the RVM trades are against the trade i.e. bounce plays in downtrends or pullbacks in uptrend, but they are are against the trend. So while the RVM setup occurred a couple times on ES trade the market has continued selling off after each minor bounce. here's a workspace I use to play the trend, these ES chart are range are set up as range bars, basically what I do is observe the exponential moving average configuration and when they expand (which Steve and I already talk about all the time anyway), I can enter a trade when price goes back to those MA's, generally I use the 34 or 50 EMA. 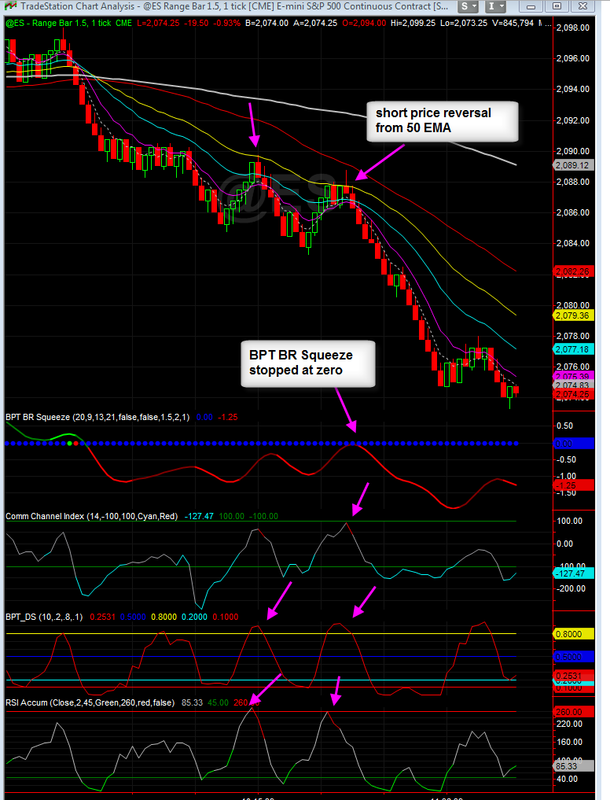 - BPT_DS stoch and RSI accum indicators got overbought and reversed.